Lionel Messi seems to have experienced a profound change. At a recent promotional event for the Chinese IT company Huawei, the acclaimed football star asserted that records and awards were no longer important to him. 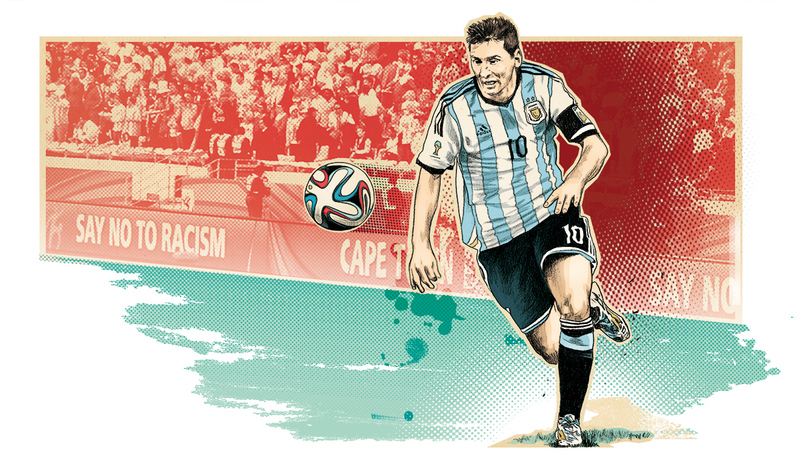 As observers have noticed of late, it almost sounds as though Messi has matured, even grown up. FC Barcelona’s megastar has made an increasingly confident impression at public appearances. During the Copa América in Chile, he faced inquisitive journalists after nearly every match he played with the Argentinian national team. Gone are the days when he abandoned his leadership the second he stepped off the pitch and gave journalists monosyllabic answers. Lionel Messi, the 28-year-old Argentinian, is widely considered to be the world’s greatest footballer. But Messi’s on-pitch charisma and his knack for brilliant split-second decisions used to vanish the moment he left the grass of Barcelona’s Camp Nou Stadium. He’d suddenly seem like a nervous child. And apparently, he also acted accordingly, leaving the big decisions that need to be made in the course of a career – which often have to do with money – to other people. This may well catch up to him in the near future. At the end of May, Lionel Messi will appear in court. The charge: he is suspected of having evaded EUR 4.1 million in taxes. To do so, Messi allegedly benefited from a network of offshore companies as intricate as the body feints, tricks, and plays he uses on the pitch. The Panama Papers now reveal that Lionel Messi apparently holds a fifty percent share of a shell company, the existence of which was unknown until now, and which Mossack Fonseca temporarily looked after. This is in addition to the offshore companies that Spanish investigators have already uncovered. The company is called Mega Star Enterprises, a fitting name for the most popular footballer on the planet, who could have gone anywhere but always stayed in Barcelona. After the tax evasion charges were made public, there was widespread concern in the city that Messi might leave the club on bad terms. His fate would then have been similar to that of football stars past, among them Johan Cruyff, Bernd Schuster, Diego Maradona, Ronaldo, Luis Figo, and Ronaldinho. Just a few months ago, however, Messi insisted that he would not switch clubs within Europe, and would prefer to end his career with Newell’s Old Boys, his home club in Rosario, Argentina, where he was born. The entire city of Barcelona breathed a collective sigh of relief. Barcelona has treated Messi very well over the course of his career. It was here that he overcame a childhood growth hormone deficiency, and he grew to 169 cm. And the footballer has won title upon title. Messi is a five-time FIFA World Player of the Year, and he has led FC Barcelona to seven Primera División and four Champions League titles. Other than the Olympic gold medal, his efforts with the Argentinian national team may not have helped them win any major tournaments. Nonetheless, he is said to be the world’s highest earning footballer. This is in addition to the already well-known allegations about Messi’s approach to managing his finances, which was already enough to get him into trouble. In October 2015, a Spanish examining magistrate decided that Lionel Messi and his father Jorge Horacio would be put to trial for suspected tax evasion. Previously, the public prosecution’s office had argued in favor of dropping all charges against Messi and prosecuting his father only. However, the Spanish ministry of finance insisted on pressing charges against the Argentinian national player. Messi must now also appear in court. Chances are Lionel Messi will dodge a prison sentence. For each of the three tax offences he has been accused of, the tax authorities, as joint plaintiffs, have called for the minimum legal punishment of seven months and 15 days. Even if he is sentenced, it is unlikely that Messi will go to jail. In Spain, only prison sentences longer than two years cannot be suspended. Moreover, the potential fine of EUR 4.1 million would be relatively painless for Messi, a multimillionaire. The trial is scheduled to begin on May 31. But how will the Spanish authorities respond to the new information revealed by the Panama Papers? Until now, Mega Star Enterprises has not been mentioned in the Spanish lawsuit’s publicly accessible documents, as a spokesperson for the public prosecutor’s office has confirmed on request. However, it could fit into the picture: according to the charges, Messi and his father allegedly used shell companies for the tax evasion they have been charged with. Lionel Messi and his father did not respond to several requests for comment. Investigators have accused the Messis of the following: starting in 2005, Lionel Messi and his father allegedly sold image rights for the superstar to offshore companies headquartered in tax havens in Central and South America, in countries such as Belize and Uruguay. Advertising partners interested in using Messi’s world-famous face then had to sign contracts with these offshore companies if they wanted to use Messi’s likeness in their advertising. The endorsement fee ended up in tax havens, and the Spanish tax authorities could do nothing but look on. This practice is nothing new in the world of sports: as early as the 1990s, professional football players in Spain sold their image rights to foreign offshore companies. This practice is also evident in the Panama Papers, which show that 20 current or former world-class football players have links to Mossack Fonseca shell companies. In Messi’s case, practically no taxes are said to have been paid for income from advertising revenues worth EUR 10.1 million, according to the charges. The money was allegedly earned from deals with companies such as Adidas, Banco Sabadell, Danone, and Telefónica. Moreover, according to the charges, the Messis allegedly withheld important information from the tax authorities to conceal foreign financial transactions. It was with these transactions that Messi apparently evaded about EUR 4.1 million in taxes between 2007 and 2009. Messi has already paid the Spanish tax authorities arrears of more than EUR 5.1 million. So far, so good. But the Panama Papers now suggest that Mega Star Enterprises was only founded on February 8, 2012, long after the cases of tax evasion already on record that will soon be addressed in court. An offshore provider in Panama founded the company, but it wasn’t the Mossfon law firm that is also headquartered there. Shares of the company were initially issued as anonymous bearer shares. Whoever physically owns these shares also owns the corresponding company shares without their name appearing anywhere. Messi:"If my father says I should sign, I do it with my eyes closed"
According to the Panama Papers, the Uruguayan law firm already mentioned acted as an intermediary for Lionel Messi in establishing Mega Star Enterprises in February 2012. This is the first link to the current Spanish charges. Shortly after, according to the Spanish charges, on February 17, 2012, the same law firm issued a confirmation that Lionel Messi was the only partner of Jenbril S.A., a shell company established much earlier, and which is at the center of the current tax evasion charges. At the very least, its lawyers thus seem to have supported the Messis in setting up the structures that are the subject of the current lawsuit. The second link can be found in the summer of 2013, when the investigation against Messi was announced. On June 12, 2013, the Spanish news agency EFE reported on the charges for the first time, and international media quickly followed suit. As the Panama Papers show, the next day Lionel Messi’s Uruguayan lawyers wrote an email to Mossack Fonseca, the Panamanian offshore provider, because they wanted a new offshore provider for Mega Star Enterprises. According to the email, the matter had already been discussed by phone. Mossack Fonseca was to manage the shell company in the future. This would see the company change hands within Panama. It appears that the Mossfon client advisors at least suspected they were dealing with a problematic company, as they insisted on an exemption from liability. This exemption was supposed to ensure that the Mossack Fonseca law firm and its sham directors would be awarded damages for any complaints, lawsuits, etc. related to Mega Stars Enterprises. Lionel Andrés and Jorge Horacio Messi signed the document of July 23, 2013, which is now in the SZ’s possession. The Panama Papers do not clearly reveal the role that the megastar himself played in the Messis’ network of companies. On one document, “investments” are stated as the general purpose of business. The leaked data did not reveal any specific contracts or business transactions concluded through Mega Star Enterprises. This may be because other people were granted power of attorney for the company. At any event, in a letter dated June 23, 2013, the father and son assured Mossfon that they would help withdraw all potential powers of attorney if the business relationship with the Uruguayan law firm were to end. With such powers of attorney, third parties could potentially open accounts, purchase real estate or conclude any type of contract without any reference to the company owner – all of this thanks to the anonymous bearer shares. If Spanish public prosecutors are not yet familiar with Mega Star Enterprises, they may be interested in finding out who was granted power of attorney, and for what reason. Although Lionel Messi’s name appears in the contracts of Mega Star Enterprises and the football star signed a number of documents himself, he won’t likely need to change his line of defense in the upcoming trial. In a hearing with the examining magistrate, Messi stated: “I don’t look at what I sign. If my father says I should sign, I do it with my eyes closed.” He also said: “I sign what my father says I should sign. I don’t look at it. I don’t focus on it. I don’t ask any questions.” This type of justification is already well known in Germany; it is almost identical to the strategy that Franz Beckenbauer used in the 2006 World Cup “summer fairytale” affair. In an interview with the SZ, the “Kaiser” also stated that he blindly signed everything his advisors gave him. Does this make Messi the small Kaiser? The father of the world’s greatest football player – the man who sent his 13-year-old son to Barcelona and signed his first contract on a napkin – has supported these statements. He claims that his son Lionel has never had access to any contracts, or to the corresponding information. He himself, Jorge Horacio Messi, stated that he negotiated the contracts and presented them to his son for signing. As far as Mega Star Enterprises is concerned, from 2015 onwards a change to legal requirements in Panama has meant that only registered shares are now allowed. In turn, the previously anonymous shares were transferred to Messi’s father in December 2015. However, as the Panama Papers reveal, when the change was made the Uruguayan law firm sent an urgent request to Mossfon, asking that Jorge Messi’s name not appear in the register. The law firm also requested that Mossfon confirm this immediately, or send the necessary documents to prevent disclosure. Lionel Messi’s court appearance will show the extent to which he has matured.